Primary, positive incentive learning mechanisms: The second type of explanation for skewed frequency distributions is very different, but is not incompatible with the restraint or control explanation. Here we are looking, not for an explanation in terms of dampening down appetitive inclinations, but rather in terms of how such inclinations might escalate or be amplified. We are looking for some kind of explanation that obeys what Aitchison & Brown (1966) called the law of proportionate effect, whereby the effect of any one influence upon behavior is proportional to the cumulative effect of preceding influences. To produce a skewed curve according to the law of proportionate effect we require a developmental theory, one that supposes that the chances of proceeding to the next stage, or of responding to the next positive influence inclining towards further 'consumption', are greater the more previous 'stages' have been passed through or the greater the number of previous influences that have been effective. Any theory which relies on an accumulation of influence would qualify. An obvious contender for a developmental theory of addiction is some variety of learning theory, in particular operant theory. Gambling provides perhaps the clearest example of Skinnerian conditioning principles, since financial payout to participants, for example on gaming machines, could hardly be better designed to produce and maintain high levels of involvement (Cornish, 1978). 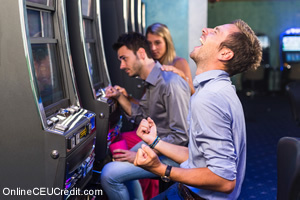 Gamblers themselves, however, often put emphasis upon the excitement associated with gambling, and it has been suggested that emotional regulation may be more important than financial gain for understanding excessive gambling (e.g. Carroll & Huxley, 1994). The power of drugs such as alcohol and heroin to change emotions rapidly hardly needs demonstrating and the idea that an excessive appetite for food might be linked to the emotional regulation function of eating is also an old one (Kaplan & Kaplan, 1957). More recently studies of eating and emotion have focused on the cycle of emotions associated with eating binges (Beebe, 1994). Typical were the findings of Hsu (1990), who found that women being treated for eating disorders described feeling less anxious/nervous/tense as an episode of binge eating went on, and also less depressed/unhappy during the early part of a binge before feeling full, and again during self-induced vomiting. Note the emphasis on negative feeling states in this very clinically orientated literature. Many attempts have been made to theorize about the nature of the emotional rewards associated with appetites that can become excessive. Although each such theory is persuasive, and appears at first to account for many of the research findings, all fail because they are overspecified. They fail to account for the diversity of emotional rewards associated with even one form of appetitive consumption, let alone with the full range of excessive appetites. This has been true of the once popular tension-reduction theory of alcohol reward (Cappell & Herman, 1972) and later variants such as the theories that tension would be reduced when self-awareness was reduced (Hull, 1981) or when conflict might be reduced by the impairment of information processing--sometimes referred to as 'escape theory' (Steele & Josephs, 1990). Both of the latter theories have also been applied to excessive eating (e.g. Heatherton & Baumeister, 1991). Similar attempts to specify appetitive reward mechanisms have been apparent at the neuropharmacological level. Attention has focused particularly upon the finding that a number of drugs increase neurotransmission in the mesolimbic dopamine system of the brain. Dopamine neurotransmission has also been found to play a role in both eating and sexual behavior, and it is this same brain system that it has been widely suggested is involved in mediating reward and reinforcement more generally. Although the consensus remains about the importance of dopaminergic transmission, most experts now favor a more broadly based approach in which other forms of neural transmission, including serotonergic, opioidergic noradrenergic and cholinergic may also play vital roles (e.g. Kranzler & Anton, 1994; Joseph, Young & Gray, 1996). The complexities of brain and appetite go far beyond the question of which neurotransmitter systems might be involved in reward. The idea of a single 'reward system' in the brain that is activated by a variety of drugs or appetitive activities implies a rather simple, unitary view of the positive outcomes from the appetites. Those who have written about the rewarding functions of nicotine are probably those that have put most strongly the point that drugs can do a variety of rewarding things for people and that these effects are likely to involve a variety of different biological mediators. Ashton & Golding (1989), for example, referred to 'intricately woven patterns of motivation' (p. 43) that are involved in the use of nicotine. Their view was that nicotine can simultaneously affect 'all the major functional systems governing behavior' (p. 42), including those for reward, for goal-directed arousal, for learning and memory, for the control of pain and for the relief of aversive states such as anxiety, frustration and aggression. Similarly, the activity referred to simply as 'gambling' takes many forms which may be associated with different kinds of emotional changes (Cocco et al., 1995). A more profound limitation of theories that have tried to specify the nature of appetitive emotional reward is their neglect of the social contexts in which appetitive acts take place. A single substance or activity may serve very different functions depending upon how a person is sociably situated. This point was pertinently made by Sadava (1975), by contrasting the functions that had been ascribed in the literature to opiate use in urban slums and those ascribed to opiate use by physician addicts. The same point was made some years later by Buchanan (1993), by contrasting the accounts of their heroin use given by low- and middle-income youth. The point is that those appetitive activities that we believe can become excessive, placing a minority of people far out on the skewed population distribution curve, are all capable of providing quick, powerful rewards in the form of emotional changes. The theories that attempt to specify the exact nature of those changes are unlikely to be able to provide anything like a comprehensive account of appetitive emotional reward since the pleasures and escapes associated with these activities are highly varied, depending upon the person, the activity, the dose, the setting and the wider environmental and socio-cultural context. If it is in the direction of some kind of learning that we should look for a developmental, escalating or amplifying mechanism to account for the excessiveness of some people's appetitive behavior, then it is likely that Pavlovian conditioning or incentive learning will constitute a large part of our model. Experimental studies with both animals and humans have shown repeatedly how activity-specific and setting cues, that in themselves have no intrinsic capacity to produce rewarding effects like those produced by an appetitive activity itself, can become conditioned stimuli through a process of classical, Pavlovian, conditioning, and hence acquire the capacity to motivate further appetitive activity (Glautier, 1994). There are in fact two different explanations for what is happening. Some responses that are elicited by formerly neutral cues in these experiments (i.e. conditioned responses) are drug-like in form whereas others are drug-opposite. For example, studies have shown that people's heart rate rises in response to cues associated with cigarette smoking, an effect that is like the initial effects of nicotine itself. On the other hand, some studies have shown that stimuli repeatedly preceding opiate injections produce reductions in people's skin temperature, an effect that is opposite to the elevation in skin temperature usually produced by opiate injections themselves (Carter & Tiffany, 1999). In keeping with the dominant drive-reduction model of the time, earlier accounts of the role of cue conditioning stressed drug-opposite responses. By mimicking the, usually aversive, psychobiological responses associated with withdrawal, formerly neutral stimuli, it was supposed, acquired the capacity to motivate further appetitive activity via drive-reduction or negative reinforcement. Wikler's (1973) model of conditioned opiate withdrawal is one of the best known. More recently, in line with the move towards positive incentive models of appetitive motivation, greater emphasis has been placed upon drug-like conditioned effects. Rather than motivating further appetitive activity through the negative reinforcement mechanism of the relief of an aversive, withdrawal-like state, conditioned cues are thought to take on positive incentive value, eliciting approach responses and signaling the probability of positive reinforcement. The preceding section contained information regarding the role of positive incentive learning in gambling addiction. Write three case study examples regarding how you might use the content of this section in your practice.